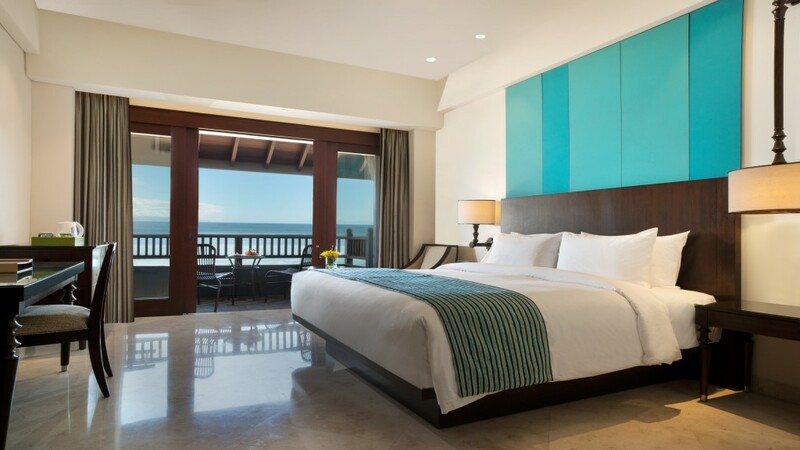 BALI, 2015-4-2 — /Travel PR News/ — InterContinental Hotels Group (IHG) has welcomed Holiday Inn Resort Bali Benoa to its portfolio of hotels on the beautiful island of Bali, Indonesia. The new resort features 171 rooms and a host of recreation facilities, offering guests a relaxing getaway on what is one of Bali’s most family-friendly beaches. Located directly on a white, sandy beachfront, the resort is less than 15 minutes from Ngurah Rai International Airport, making it ideal for a quick getaway or a longer stay. Guests can choose from a wide selection of room types, all with their own balconies and outdoor seating to enjoy the balmy sea breezes. For families, the resort offers a variety of rooms created with them in mind, including Family Connecting rooms, and Kids Adventure Suites and Family Adventure Suites, designed to appeal to kids’ imaginations with bright colours and toys to keep them entertained, whilst also staying within earshot of Mum and Dad. As with all Holiday Inn properties worldwide, the resort offers the brand’s signature, Kids Stay & Eat Free programme*, with kids under 12 eating and staying for free. The resort features a variety of recreation facilities for kids both big and small. The resort has four pools to choose from, including a kids’ pool complete with slide and fountains, an infinity pool and two pools with swim-up bars. The circus-themed Kids’ Club includes climbing walls, ball pit and slide, lots of arts and craft activities, as well as a computer zone and relaxation area. The kids’ club is open daily from 9am-5pm and 6pm-9pm. Throughout the day, the resort offers diverse leisure activities to choose from, for both the more active amongst the group and those with relaxation on the agenda. For the ultimate in pampering, guests can indulge in a session at the resort’s Tea Tree Spa, with professional spa attendants and locally-sourced products. For those after a bit of activity, its calm waters means Tanjung Benoa is perfect for water-sports. When it’s time to eat or have a drink, guests have three different restaurants and bars to choose from: Pasar Market Café, offers daily buffet breakfast and dinner, as well as themed a la carte evening menus and deli lunches; live entertainment and panoramic beach views at the dual-story Nudi Beach Bar in a Balinese-style pavilion; and Duke’s Pool Bar & Lounge for chilled-out drinks. Including this new opening, there are now five IHG hotels in Bali, including a sister property, Holiday Inn Resort Baruna Bali, and the award-winning InterContinental Resort Bali in Jimbaran Bay. For bookings from now until 15 June 2015, guests will enjoy a special opening rate of USD $99++ per night. For more information and to book a stay, visit www.holidayinn.com. This entry was posted in Beach Holidays, Hospitality, Hotels, Resorts, Travel Services, Travelers and tagged Alan Watts, Holiday Inn Resort Bali Benoa, IHG. Bookmark the permalink.